Insects are the worst when it comes to outdoor activity. Sometimes it’s nearly impossible to have a barbecue without flies bombarding the food and mosquitoes feeding off us. But the idea of spraying your yard and your family with all those chemical remedies found in the stores just doesn’t sit right with you. Try essential oils. These volatile compounds, extracted from the herbs, berries, flowers, roots, stems, and sap of the world’s plants and trees are a perfectly natural way to keep the bugs away without polluting your surroundings. Typically, they are extracted by steam distillation or a process known as cold pressing or expression. 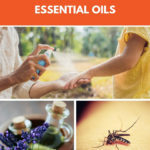 You can use one or more of these scents to create a blend to wear topically to keep from getting used as a smorgasbord for the entire mosquito population. Or, you can use a diffuser outdoors that emit enough mist to keep all the flying and crawling visitors away. If you can’t decide which application would work best for you, then you can try both. That’s another perk about essential oils. You can use some of them to create a blend and diffuse some more. There are so many drops in one bottle, it’s doubtful you would use it all in only one way. The best part is that you will reap all the other benefits these essential oils have to offer. Important Disclaimer: The information contained on Better Mind Body Soul is intended for informational and educational purposes only. Any statements made on this website have not been evaluated by the FDA and any information or products discussed are not intended to diagnose, cure, treat or prevent any disease or illness. Please consult a healthcare practitioner before making changes to your diet or taking supplements that may interfere with medications. We recommend and link to certain products and offers throughout our site that we think will benefit our readers. If products are purchased through some of these links, We may earn a commission. Copyright © 2018 by Better Mind Body Soul.